Reading Sri Ramacharitamanasa of Tulsidas is always a rewarding experience. Indeed the original verses are so sweet that are no less a symphony stilled into the scattered words. They are not merely poetic in the sense you enjoy the structure and meaning and say ‘wow’! The work is undoubtedly a grand epic poem but the poem that is pro-active in putting an end to your slumber, in awakening you from dreamy sleep, and in instructing you on your way up. Can we have that same magic in its translated version? Very many people affirm a big NO! I have of course read prosaic translation in English that does not, in my humble opinion, do justice to the original. And how difficult is to translate the original in English verses? Will that make an appeal to your heart? These were some random thoughts when I received a response in the Comments section, the following from Skendha. Who is she? A young lady from New Delhi, she is a regular visitor to this blog. In her own words, somewhere else on the internet, “I’m more a mind demon, love reading, writing, eating!…Idealistic and spiritual and sensitive…” Her favourite quote is always from Swami Vivekananda. Translated from Goswami Tulasidasji’ SriRamCharitMaanas. Lakshman behold the peacocks ! Discovers a Vaishnava monk in sight. Darting and flitting as do the sentiments of a rake, loyal to no one. With calm fortitude as the saints, who endure the fool’s comments. Glorying in their noveau riches, just as the knave who must make a show. Muddied, as if they were the soul of man tarnished by dark delusions. Sojourning like the soul which, merging with Hari, attains eternal peace. Blissful as when the bramhacharins, chant the Vedas, to herald the dawn. Are beautified as the mind of a seeker which, blessed by intellect, becomes serene. Oh look Brother! how the stars are challenged by this brave battalion of fireflies! Ill-advised as the gathering of cheats who make a hollow show for all eyes. Ravaged as the senses of a man, in whom discrimination has made conquest. But He is hidden again and lo! it is night. It fires or smothers our Eternal Light. Absolute inspiration for a weary traveler that had lost her way! Indeed true! Thats why our scriptures are called ‘maargadarshi’ – guideposts. My sincere thanks to Skendha who has translated so nicely the Ramcharit Manas. At the same time I am not finding my words how I am grateful to you. Your each and every post is not only interesting but very educative. Staying far in South Africa you are really helping devotees of the whole world and making a good relation with each other. I am remembering the words from Gita “sutre maniganaa iva“. This you are doing through your blog. Maharaj ji, 6th is Ratha Yatra I am expecting a good post from you. This is just my humble way of expression of my seva to IT-enabled public. Nothing more need to be read. For your info, Ratha Yatra is NOT on 6th July but as per the Bangla panjika (almanac) it is scheduled on 3rd July which is 18th day of Ashaadh. May Sri Sri Thakur bless you! Extremely sorry, Yes you are right! Ratha Yatra is on 3 July, 2011 Sunday. One can effortlessly picturize the magic of the rainy season from such verbal eloquence. Kudos to Skendha for a job so meticulously done and thanks to Maharaj ji for sharing it with us! Happy that you enjoyed reading the English version of the passage from Sri Ram charit manas! well done by Skendha. May the pure joy help in intensifying your devotion at His lotus feet! I read the first line an I am already enthralled. Unfortunately I cannot enjoy this at the moment as there is too much going on in the office to give this the respect that it deserves. I shall print it out and get back to you. Happy that you would like to study the translation out of office hours! I shall await of course your response in time. Rama personifies courage and fearlessness that Swamiji so often spoke of. That is how I look upon Rama. Ramakrishna whose personality combined both the manly and the feminine aspects of Godhood showed this former aspect through the life of Swamiji. That is why Thakur is the Purna Avatar. Maybe I am wrong. Maybe to call Thakur an Avataar would be to belittle him…….for how can a limited mind comprehend something that is larger than even the infinite. Your idea indeed is thought provoking! There are various explanations for the concept of purna-avatar. MASTER: “What need is there of your counting the number of trees and branches in an orchard? You have come to the orchard to eat mangoes. Do that and be happy. The aim of human birth is to love God. Realize that love and be at peace. I am deeply humbled at this graciousness beyond compare. And I truly have no words except offering pranam. The original passage is so striking and poignant that it inspires even the dullest of hearts such as mine. It is the spiritual genius of Goswami Tulsidas at work. Congratulations on the 100th post on this wonderful blog Revered Maharaj! Prayers to Sri Ma that we may see the thousandth here! Also the layout of each post is beautiful as Revered Maharaj has a keen aesthetic sense, and it is fully displayed in this one. In this country as I said earlier, the India origin people seldom use their mother tongues. Thats why whatever in connection with our ancient culture, tradition etc comes up in English, they just love to go through. They are so much interested in Ramayan of Tulsidas that they love to read it in English. They have deep devotion. It is in this context, I was very much impressed when I saw your translation. Then I decided to place it in my blog. From the comments that are coming, you might have noticed how this translation has become a joyful reading for others. There are some that they savour their own creations and deny them for others. There are some others who share their creations with others. If only M had kept his diary for himself, the world would have been bereft of Kathamrita – The Gospel of Sri Ramakrishna. If only Swami Saradananda had kept his writing on the Life of Master with himself only, we would have lost the Great Master. Many a time creative writers start writing for one’s own pleasure but to make it available for others also is necessary. It comes under paropakaram. Shying from that sharing seem to be a selfish attitude. So, if you have been doing the translation of other selected passages from the Ramcharitmanas, do continue with all verve and vigour. Don’t worry now about the sharing with the world but just go on writing…And think of it if even one person is benefitted by reading what you wrote, it is so wonderful as the Bhagavata says bhuvi grnanti ye bhurida janah they are magnanimous who spread the word of God! May Lord Sri Ram help you in spreading His glory! My sincere congratulations on your 100th post. This blog has played an important role of inspiring so many people towards god. May it continuously grow is my sincere prayer! I totally agree that translations do not really do justice to what the writer is trying to convey. Shri Ramchandra Kripalu bhaj man, haran bhav bhay darunam, Shri Ram. Haran bhav bhay darunam, Shri Ram. Pata peet manahu tadita ruchi shuchi noumi, janaka sutavaram. Whose eyes, mouth, hands, and feet are like a newly blooming red lotus! Who is the consort of the daughter of Janak. Maharaj! although reading the translation we are awestruck by the description of Shri Rama. But listening to it in the original form really brings tears to my eyes. I wish sometimes we were all knowledgable in the languages that the scriptures were written in, so we can feel the love, bhav, and emotion with which it was presented. May we attain the grace of God! Sincerity rings in your warm appreciative words! Many thanks for that! It is absolutely true that in absence of encouragement from the avid readers, it would not have been possible to attain the milestone of 100th Post! By quoting a mesmerising bhajan of Tulsidas on Sri Rama, you have nudged my nostalgic memories of the past – when in the years between 1971 and 1975, at our Kanpur ashrama, as a novice brahmacharin, I used to sit and listen to Revered Purananandaji Maharaj whose mellifluous voice would actually take me to a different world! The bhava would ooze out to make your eyes wet! This must be my eternally favourite song! Sometimes I do wonder at witnessing the devotees in this land, getting into bhava without knowing the word-by-word meaning. And there are some like me who understands the grammar and meaning but bereft of bhava! for you although we see you! May the grace of God flow unceasingly! your words drew me there. Revered Swami Vimokshanandaji Maharaj has told us about your considerable experience, dedication and genius.. and therefore your benediction is precious beyond words to a novice such as me. I am a devotee of Sri Ramakrishna, Swami Vivekananda and the Holy Mother, and am extremely delighted to come across this site of yours. I am presently based out of Hyderabad. If you have any plan of visiting Hyderabad kindly let me know. A hearty Welcome to this site! I am so happy to know that you are a devotee of the Holy Trio. I hope you have been blessed with mantra-diksha already. Pay attention to your sadhana. Do you visit our Ashram in Hyderabad? Its a wonderful ashram. I had stayed there for a few days when I was involved in Relief & Rehabilitation Program for the tidal wave affected poor families in coastal Andhra sometime in 1978-79. As on now, no plans to visit India. Rest Master only knows! Inscrutable is His Maya!! May your devotion at His lotus feet grow leaps and bounds! Thanks Maharaj for these blog posts. Only a pure, flawless, and experienced (with the highest knowledge) Soul can speak such beautiful words of the Divine. It is through these blog posts we are able to acquaint ourselves with such Divinity as Tulsidasji. Skendha! May Sri Raam‘s Grace be ever upon you! You are absolutely right Meera, when you say that “Only a pure, flawless, and experienced (with the highest knowledge) Soul can speak such beautiful words of the Divine.” Tulsidas belongs to the saints of highest order who are pure in heart. Thats why he could have darshan of Sri Ram in his home as his guard! Tulsidas remained silent and wept. 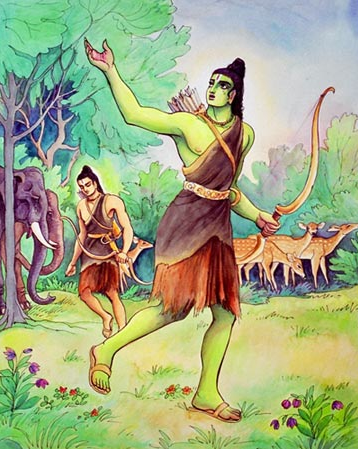 He came to know that Lord Rama Himself had been taking the trouble to protect his goods. He at once distributed all his wealth among the poor thus reducing the burden (!) of Sri Ram!! May reading about such divine souls intensify your devotion at His lotus feet! Thank you for putting such a beautiful translation here. I saw your blog only two days ago and I am already feeling that it’s a treasure trove. May God bless the translator! Thanks for the appreciative words from some one from the North-East! I have nostalgic memories of your place, not only for Kamakhya Devi but also for the wonderful monk of Guwahati ashrama late Swami Ijyanandaji. He was one of mentors (guru-tulyo) for me. The translator Skendha of New Delhi would be happy to read your comment. Actually I am not from Assam. I am from Bengal but I study here. I have visited Kamakhya Temple and also Guwahati Ramakrishna Mission. My mother’s cousin has become a monk, now in Jayrambati (Tushar Majaraj). I also want to join Sri Sarada Math when I have completed my studies. Please bless me that this dream becomes a reality for me.